New uncle Prince Harry finds his name top of the list - will his nephew Prince George usurp him in 2013? 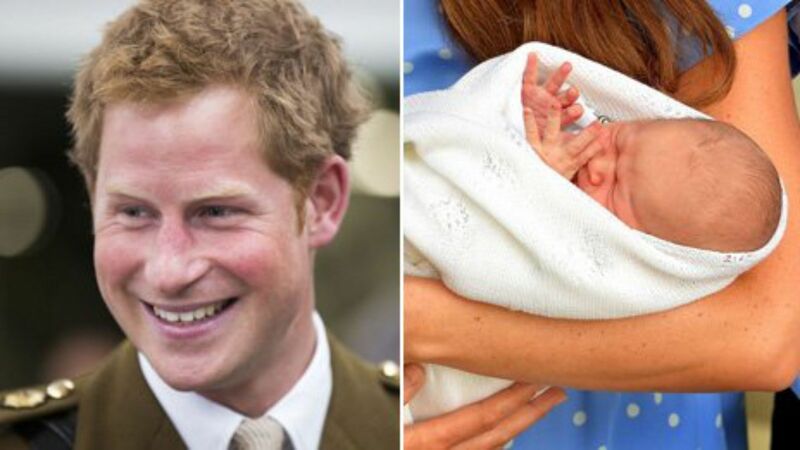 Harry and Amelia were the most popular first names for babies in England and Wales in 2012 - taking the top spots for the second year running. Riley was a new addition to the top 10, while Muhammad was the favourite name for boys born in London. Mia and Isla replaced Ruby and Grace in the top 10 for girls, according to the Office for National Statistics (ONS). In total, more than 28,000 different boys' names and over 36,000 different girls' names were registered in 2012. In Wales, Jacob and Amelia replaced Oliver and Lily as the most popular names. Scotland and Northern Ireland released their data for 2012 in December - Jack and Sophie took top spot in both. There were seven new entries into the top 100 boys' names for England and Wales - Hugo, Sonny, Seth, Elliott, Theodore, Rory and Ellis. They knocked Joel, Hayden, John, Ashton, Jackson, Ben and Reece out of the top 100. Six new names entered the top 100 for girls - Mollie, Ivy, Darcey, Tilly, Sara and Violet. Slipping down to make way for them were Lexie, Lauren, Rebecca, Tia, Nicole and Kayla. The ONS said there were 729,674 live births in England and Wales in 2012, with the top 10 names accounting for 13% of all of those given that year. Amelia was the most popular name in all regions of England. Harry was top in seven out of nine regions in England, with only Muhammad and Jack beating it in London and the North East respectively. Among boys, Bobby showed the largest rise within the top 100 from 2011, gaining 19 places to number 57. For girls, Elsie was the highest climber, rising 17 places to 70. Aiden and Isobel were the biggest fallers, dropping 19 and 18 places respectively year-on-year. Five of the top 10 most popular boys' names in 2012 were also in the top 10 in 2002: Jack, Thomas, James, William and Oliver. When compared with a decade ago, the biggest increase in popularity among names now in the top 10 was Riley (up 114 to number eight). Benjamin - down to number 32 - has fallen the furthest since being in the top 10 in 2002. Among those now in the top 100, Kayden has seen the biggest surge in the past decade, rising 662 places to number 92. Four girls names which featured in 2002 have maintained a place in top 10 a decade later - Olivia, Jessica, Emily and Sophie. Of the names in the top 10 in 2012, Isla has risen the furthest, up 268 to number 8. Megan, meanwhile, has seen the most significant drop out of the top 10 - falling 35 places to number 41. Among names now in the top 100, Lexi has climbed the most places since 2002 - up 1,613 to number 46. Don't forget that when you order sheets or mattresses from us at Baby Mattresses Online you can have your baby's name embroidered onto the product and we also make personalised baby changing mats.